A number of our patients are periodontal patients. What that means is they have had bone loss around their teeth because of a bacterial infection. To treat periodontal disease we start with a deep cleaning, scaling and root planning, to remove the tartar that is deep in their gums causing the infection. From then on we see these patients every three to four months to maintain their periodontal (gum) health. 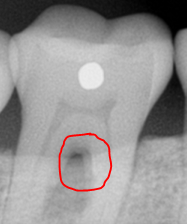 Below you can see the difference in the bone loss around this patient’s molar furcation area. The first image shows you initially what the patient presented with. This patient completed full mouth deep cleaning and we have been seeing them every three months for the past three years. The second photo shows you the same area now. 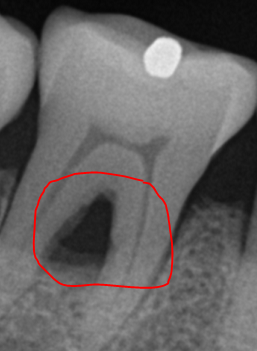 The areas that are circled show you the amount of bone around the tooth. You can see the improvement! We screen all of our patients yearly for gum disease. It is so important for your oral (and overall) health to floss or use a waterpik daily to avoid gum disease and tooth loss!